On Friday the 1st of July, Year 5 had their art day. We looked at the life, art and style of Vincent Van Gogh. He is considered one of the greatest painters of all time, but only sold 1 piece of art while he lived. We learned about his life, before planning and sketching our own versions of Starry Night. “The Starry Night” – Painted in 1889. 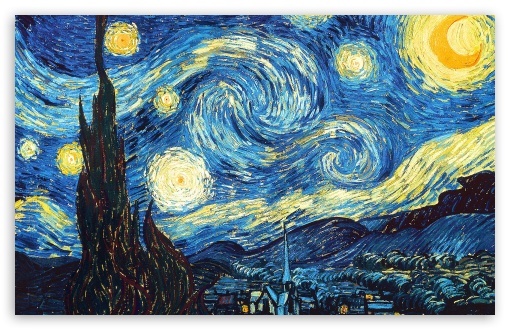 To design our own versions of Starry Night, we wanted to included the night sky, similar to Van Gogh, but we wanted to include local landmarks infront of the sky. We decided on some of the following landmarks: Penshaw Monument, Tyne Bridge, Arbeia, Angel of the North and Souter Lighthouse. First we sketched them and tried to recreate the swirly sky in our art books with both pencils and felt pens, before recreating them on a canvas with paint. We also tried to recreate his style when doing our own self-portraits and used the internet to find information about him on the internet to create a fact booklet about Vincent. Make you feel emotions or moods when you study it, such as saf, scared, tired or happy. ← Y4R working on critical thinking skills and teamwork.